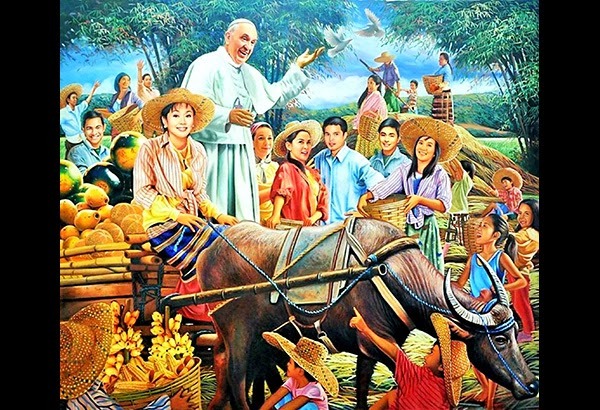 Filipino Artist Paints Pope Francis Enjoying The Rural Life With Kris Aquino, DongYan, Coco Martin, Etc. In less than a week, the big man of the Catholic Church will set foot upon the shores of the Philippines for a series of activities that will include paying the President a visit at the Malacanang Palace, a mass at the Manila Cathedral, and lunch with survivors of Typhoon Yolanda. Being a nation populated mostly by Catholics, the archipelago is in celebratory mood. Trinkets, t-shirts, pendants, posters, books, you name it, featuring the Pope are being peddled in the streets. The country's television stations, radio stations, and print publications have been covering the upcoming event non-stop. In short, when Pope Francis lands in the Philippines come January 15, it's going to be the start of a Big Day, at least for majority of Filipinos here and abroad. The anticipated visit has also inspired a lot of Filipino artists to incorporate the Pope in their work. Songwriters wrote songs about him. Writers wrote pieces about him. And visual artists created masterpieces featuring him. Among the latter is Dante Hipolito who is stirring a bit of controversy with a recent painting of his. In the painting, Hipolito had the Pope Francis enjoying the company of celebrities namely Vilma Santos, Gary Valenciano, Grace Poe, Marian Rivera, Dingdong Dantes, Coco Martin and Kris Aquino. Salubong by Dante Hipolito. Photo from the Philippine Star in an article by Edgar O. Cruz. Looking at the painting, I don't know what to make of it. What is Hipolito trying to imply? There's an article on the Philippine Star related to the painting but it doesn't divulge much with regards to the painting's message. I guess the celebrities are there because they are fans of the Pope. But why? The painting will be displayed at a group show at the Galeria de las Islas from January 25 to February 20. Maybe Hipolito will talk more about the painting there. The theme of the painting aside, it's a really good looking piece. Hipolito is an amazingly talented artist. Just check out a gallery of his works here. I can't afford buying originals of his works but I wouldn't mind purchasing prints of them.